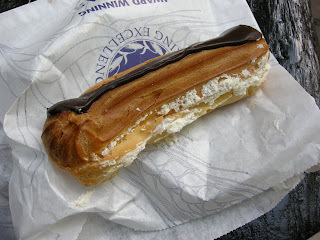 This was lunch: a yummy eclair that I took to a nearby square and ate while sitting on a bench watching pigeons. It's nice again today, a good day for a picnic. Thomas the Baker is a chain (there's a couple of these stores in York) but the baked goods are pretty good. 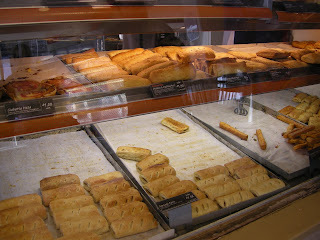 They do a lot of cornish pasties as well as cakes and cookies and goodies like eclairs. For dinner I went to a pub and had their rumpsteak special. 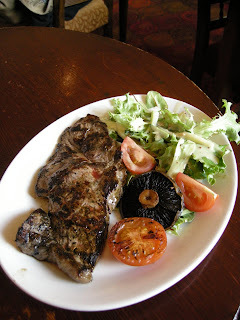 It was cooked well, and tolerably good, especially for only 5 pounds. I love how the English serve mushrooms with everything- as a garnish, even with breakfast! I would be happy to have a Thomas chain in my neighborhood!